Happy Skin Kitchen – Page 26 – The quest for beautiful skin starts on your plate. I am always on the hunt for on the go breakfast recipes. I have been loving working out before go to work recently and although most of times I have breakfast after my work out, sometimes I like to have a little snack before as well (any excuse to eat is always a good one). Most of the breakfast bars you buy in the shops tend to be packed with sugar, so I definitely recommend to make your own, especially when they are so easy as these banana, sultanas and cacao one. You can make these bars completely sugar free, by eliminating the dates syrup and using only extra ripe bananas that combined with the plump sultanas should add enough sweetness. The extra bonus of these bars is that they also taste of chocolate and let’s face it, who wouldn’t want a bit of chocolate in the morning? 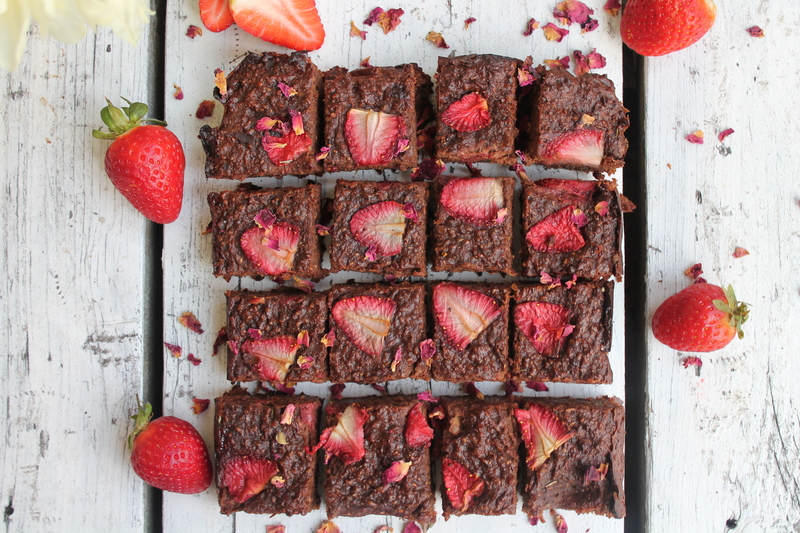 J These are totally chocolatey and yet totally healthy as I have used raw cacao, that in case you don’t know is packed with anti-oxidants, magnesium, calcium, zinc and copper! So enjoy these beauties without any guilt, knowing that they are actually good for you! Start by soaking the sultanas by covering with warm water and set on one side for at least 1/2 an hour. In a bowl mash the bananas with a fork. Add all the other wet ingredients. Drain the sultanas and squeeze the excess water out. Add them to the bowl. In a separate bowl mix all the dry ingredients. Add the wet ingredients to the dry ingredients and mix well together. Line a baking tin with parchment paper, pour the batter into it and smooth it out with the back of a spoon. Place it in the oven and bake it for about 25-30 minutes. Leave it to cool for about 10 minutes into the tin, before transfer it to a cooling rack. Slice it into bars and enjoy! So I thought why not combine these three things together?! I know it sounds really weird (chocolate hummus what?!) but I promise you it works so well. If you think about it, chickpeas have a very neutral flavours, unless you add spices or seasoning to them they taste pretty bland. For this reason I think they are the perfect base for this protein packed spread. 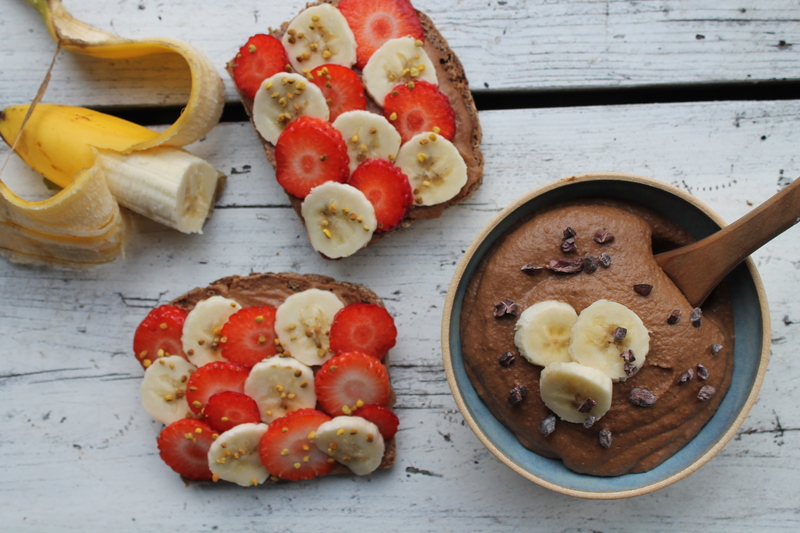 Add almond butter for creaminess and flavour, banana for sweetness and when you finally add the raw cacao powder the all thing just come together in a beautiful silky, creamy, packed with goodness chocolate flavoured spread! It’s just the perfect post workout snack or breakfast. I love spreading some on rye or gluten free bread and top it with fresh sliced strawberries or more bananas. Simoly place all the ingredients into a food processor and blend until smooth and creamy. I have used my Vitamix in this occasion and it worked perfectly. If you feel your hummus is too thick add gradually more almond milk until you reached the desire consistency. Keep in an airtight container or jar for 4-5 days. 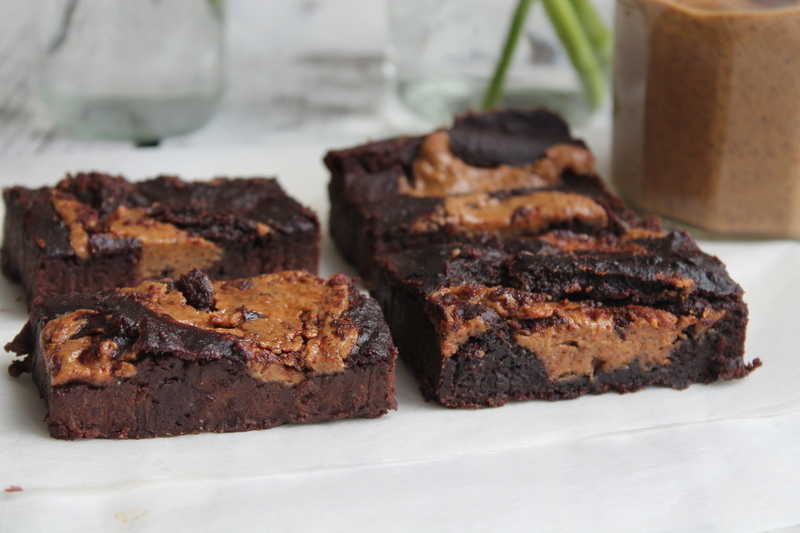 I am always experimenting with gluten free chocolate brownies and I am still looking for that kind of fudgy, dense, perfect consistency, well I think this time I got pretty close. There is always room for improvement obviously but hey these little beauties are so so good! I have topped them with strawberries as I find when they bake they become particularly sweet and almost pungent. 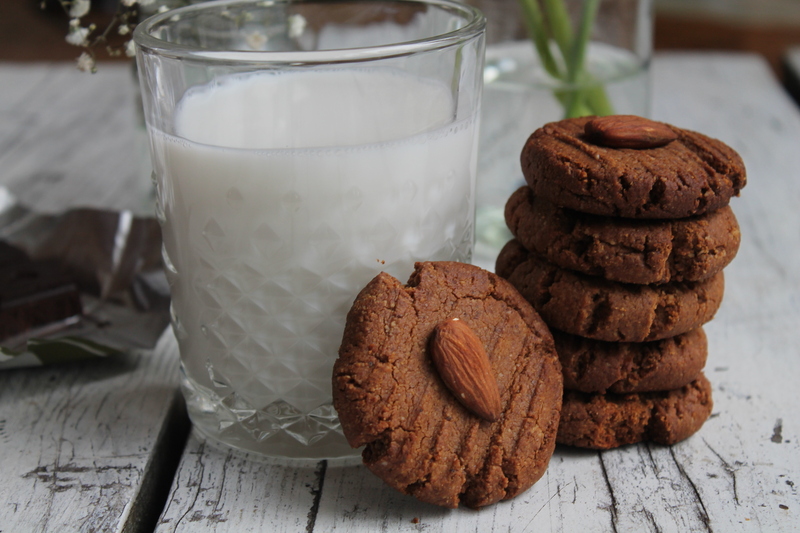 Apart from being gluten free they are also paleo as I have only used almond flour. As regard of the sweetener the stars of the show are dates! they are just the best, aren’t they? 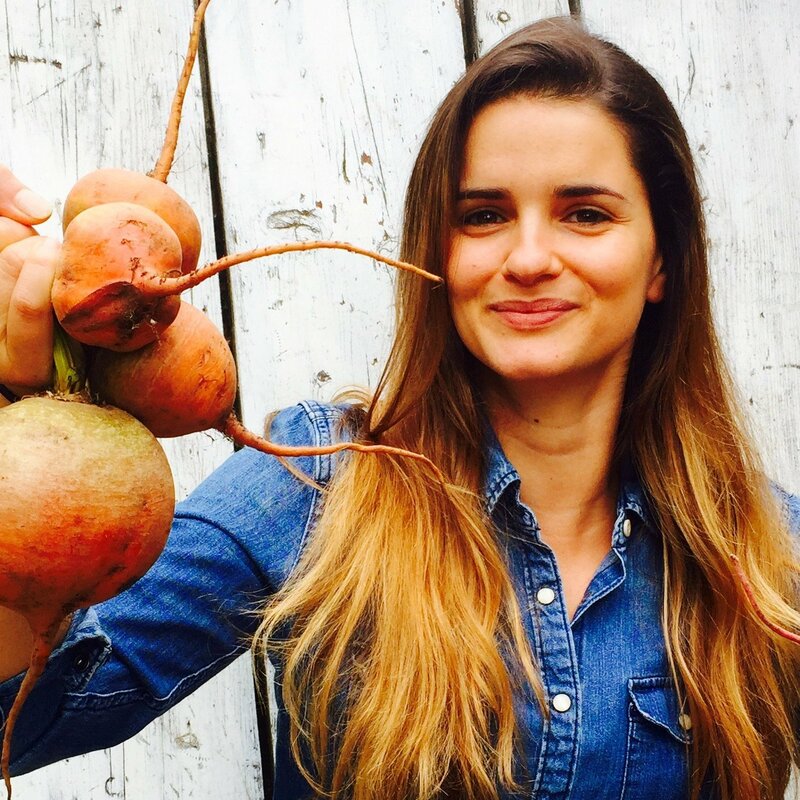 They are naturally so sweet and they also are packed with essential minerals like zinc, magnesium, calcium, iron and fibres. Start by preheating the oven at 180 degrees Fahrenheit. In a bowl mix the chia seeds with the water and set aside until a gloopy gel starts to form. Place the pitted dates, melted coconut oil, cashew butter, almond milk and maple syrup in a food processor and blitz until it becomes a thick paste. Pour the mixture into a bowl and add the ground almond, raw cacao powder and chia seeds and combine well. Pour the batter into a baking tin lined with parchment paper and smooth it out evenly. Cover the surface with the sliced strawberries and place it in the oven for 35 minutes or until a tooth pick will come out clean. Let the brownies cool COMPLETELY in the tin before remove them and slice them. I store them in an air tight container in the fridge for up to a week. I have always been a sucker when it comes to granola, it used to be my go to go breakfast for years until I realised how much sugar the regular shop bought granolas almost always have. This granola instead is incredibly low in sugar and obviously high in goodness! I haven’t used any maple syrup or honey, the sweetness comes entirely from the apples and the dried apricots, combined with some gorgeous velvety almond butter it literally creates the most gorgeous, nutty, caramel taste granola. Start by dehydrate the apples. Place the chopped apples in a tray lined with baking paper and sprinkle them with 1 teaspoon of cinnamon powder. Place the them in the oven at 120 degrees for at least 40 minutes. After 20 minutes stir them to make sure they cook evenly. After 40 minutes the apples should be golden brown and crispy. Take the tray out of the oven and leave it on one side to cool. To make the apricot and almond butter paste: chopped the dried apricots in small pieces and place them into a food processor with the almond butter and the coconut oil. Blitz the mixture for about 1-2 minutes until it becomes a soft and sticky paste. Line a tray with baking paper, add the oats, the remaining cinnamon powder and the chopped nuts. Pour the apricots and almond butter paste over them and with your hands combine everything together, you should get sticky clusters of oats and nuts. Place the tray in the oven and bake at 120-150 degrees for 45 minutes. After 20 minutes stir the granola to make sure it doesn’t burn. After 35 minutes take the granola out and add the coconut chips, the sunflower seeds and the pumpkin seeds. Place it back in the ice for a further 10 minutes. Once the granola is nice and crunchy take it out of the oven and leave it to cool. Once it’s all cooled down add the dried apples pieces baked previously. I like to also add gojii berries, quinoa pops and buckinis, these are totally optional and the granola will taste as delicious without. Store the granola in air tight jar for up to 1 month. I like to serve my granola with almond milk, sliced banana and fresh berries, it is seriously the best breakfast! 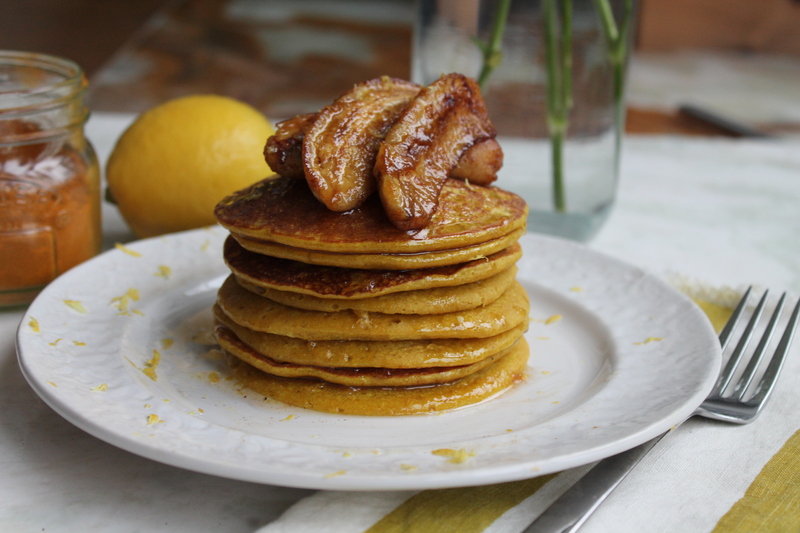 Since I have made my lemon and turmeric pancakes I have been obsessed with this incredible combination of flavours. Apart from having quite a mild flavour, turmeric is jammed packed with endless health benefits. The one which wowed me the most is that Turmeric is a very potent skin loving superfood. It has been proven to help fighting and healing acne and in the Indian culture is also use in skin lotion and moisturises. I try to incorporate turmeric into my day to day cooking as much as I can and why not using it in sweet recipes as well? It works extremely well with all warm, exotically sweet flavours, like bananas, dates and coconut but also with apples, pears and apricots which I decided to use for this recipe. If you don’t have dried apricots on hands you can certainly use dates, although I love the sweet but slightly fresher flavour of apricots mixed with the dried coconut. These little beauties make the perfect antioxidants packed afternoon pick me, I like to make a big batch on Sunday and happily munch them throughout the week. Add all the remaining ingredients and blitz again for about 2-3 minutes until a sticky dough starts to form. Remove the dough from the food processor and with your hands roll about 1 tablespoon of the mixture into a ping pong size balls and coat them into the shredded coconut. Continue this process until all you finish all the dough. 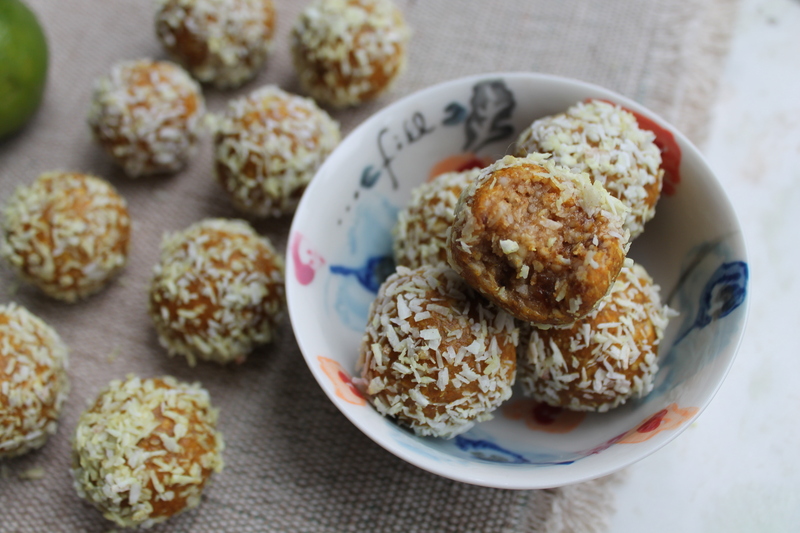 Store the bliss balls in the fridge for up to 4 weeks. 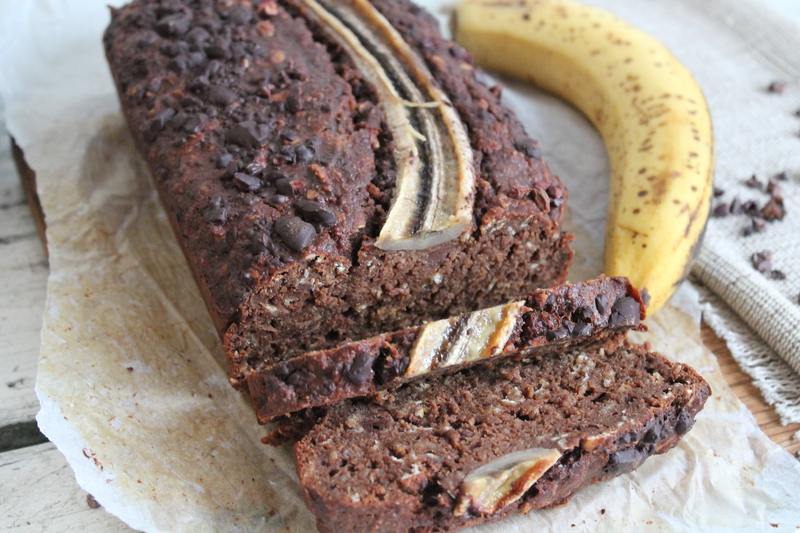 This banana bread could possibly be my favourite thing at the moment, I am eating for Breakfast, in the afternoon as a snack, after dinner for dessert, I am totally obsessed with it! 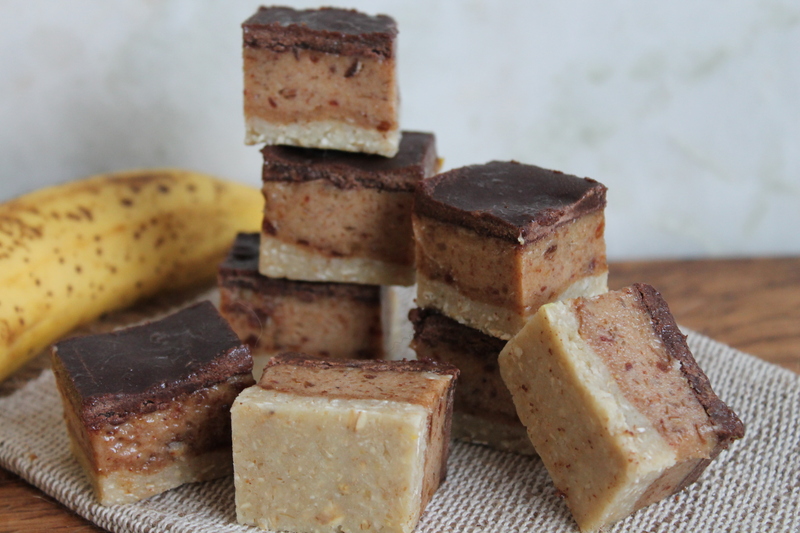 It might be because it combines three of my favourite food: almond butter + banana + chocolate, what more can I possibly ask for? I know it’s sound pretty decadent but is actually relatively low in sugar as the bananas act as the perfect sweetener so you actually don’t need to add much more maple syrup or coconut sugar. For the chocolate I have used roughly chopped OM BAR 70% dark chocolate as it’s so intensely rich and only sweeten by coconut sugar, but any other good quality dark chocolate would work as well. Preheat oven and line a loaf pan with parchment paper. Prepare flax egg in a large mixing bowl and let rest for 5 minutes until it assumes a gloopy consistency. Add the bananas and mash thoroughly. Add all ingredients through almond milk and whisk vigorously to combine. Add the cacao powder, almond meal, brown rice flour blend, oats and stir. Last stir in the chopped chocolate. If using sprinkle the cacao nibs on top. Pour into loaf pan and bake for 1 hour – 1 hour 15 minutes. When ready should be firm with a nice crust on top. Let cool completely before cutting it into slices. I love having mine with some almond butter and some slice banana on top. 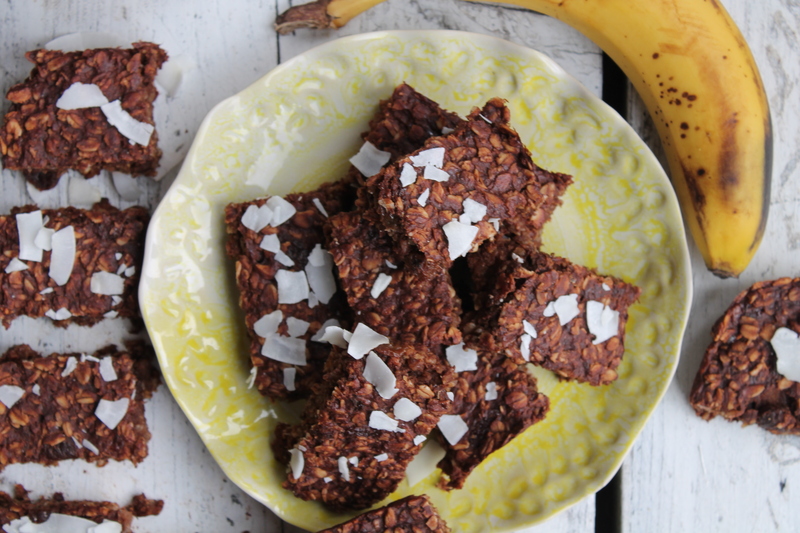 Apart from being super indulgent, rich and decadent they are super healthy too, full of protein and skin loving omegas from the nuts and the coconut oil and packed with magnesium and antioxidants thanks to the banana, dates and cacao. So plenty of reason to make these little beauties and most importantly, enjoying them! place the oats in a food processor and grind to a flour like consistency. Add all the other ingredients and pulse until it comes together when you pinch it in your hand. If it is still too crumbly to hold together, add 1/2 – 1 tablespoons of water. Press in to a tin and place in the freezer while you make the banana caramel filling. Blend the dates until they form a paste and then add the other ingredients blending until a smooth caramel forms. Spread onto the base and then return it to the freezer. Melt the Coconut oil in a bain marie. Once melted add all the other ingredients and stir until you have a nice smooth chocolate. Pour onto the other two layers and leave to set in the freezer for at least an hour.Remove from the freezer 10-15 minutes before slicing to prevent it from cracking.